Try your luck at a large selection of video and skill games in this space-themed area. Selected merchandise is available nearby. 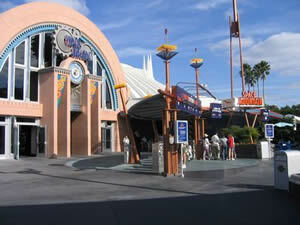 Best time to visit: Anytime, after riding Space Mountain. A convenient venue to keep non-riders of Space Mountain, especially kids who don't meet the height requirement entertained while the rest ride. The arcade is wheelchair/ECV accessible.